I believe with all my heart that parents should leave the children behind once per year for a romantic getaway. It’s good for your relationship, your soul, and, therefore, your kids. If you and your partner are in need of parental rest and like delicious food, great wine and incredible scenery, you’ll love Sonoma Valley, California. And, you’ll especially enjoy a stay at the historic Applewood Inn. Here’s why. This historic inn began as a private, mission revival-style home. Built in 1922, it became the Applewood Inn in 1985, when its new owners opened this romantic bed & breakfast. The inn is part of the Select Registry of Distinguished Inns of America. 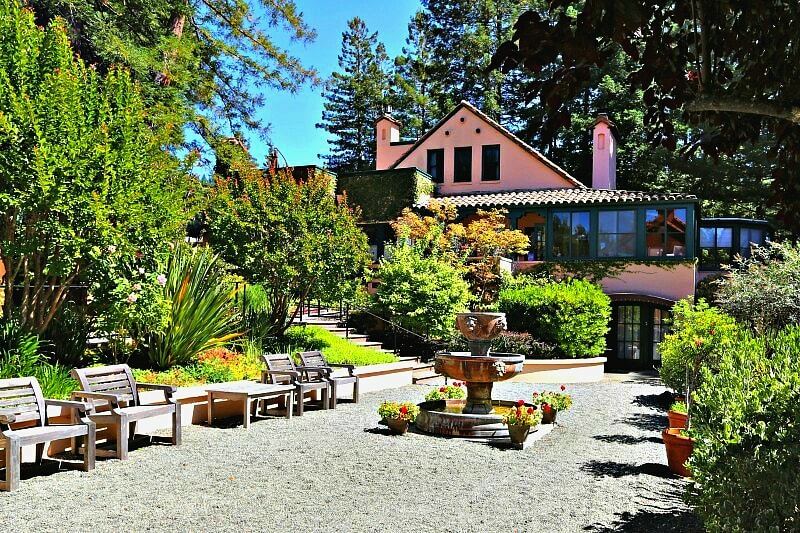 Applewood Inn makes a fabulous base from which to visit the more than 400 wineries and many restaurants throughout Sonoma. 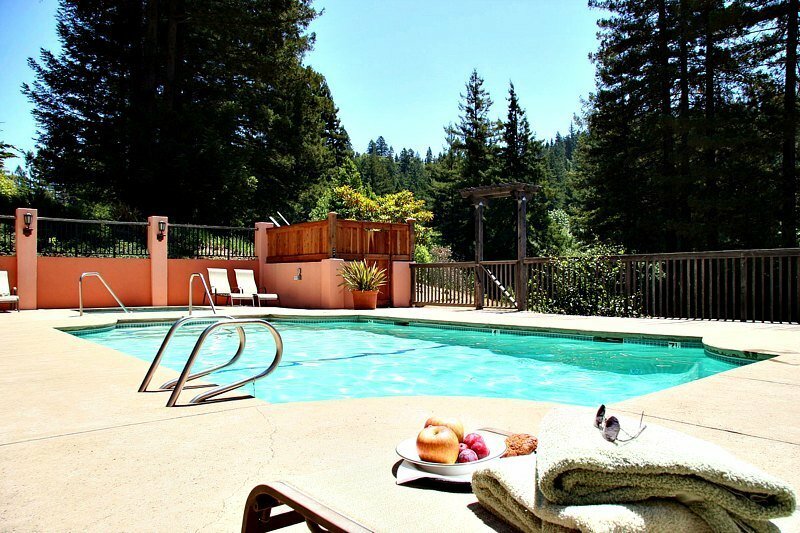 The Inn is located in Guerneville, just 20 minutes from the Northern California coast on the western edge of Sonoma County. The journey from San Francisco showcases the gorgeous brown and golden hills of the dry Sonoma Valley. The colors change to the lush and green Russian River Valley, populated with large conifers like Douglas Firs and Redwoods. During my spring visit with my husband, the winter rains had made the hills as green and verdant as the Irish countryside. 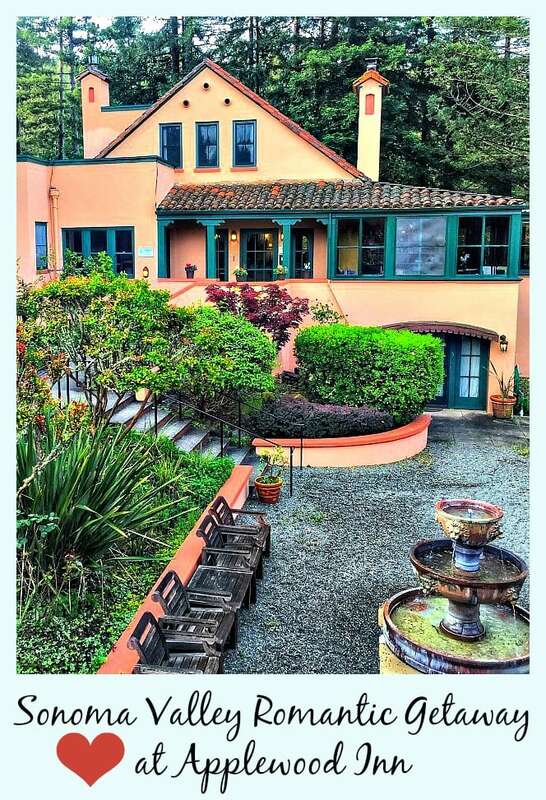 Belden House contains nine rooms, as well as the inn’s check-in desk and a fireside reading area. You’re greeted with a glass of local wine as you collect your room keys and chat about the the wineries you’ll be visiting during your stay. The remaining suites are located in buildings built in the 1990s. There are just 19 rooms in total at the Applewood Inn. Many rooms, including ours, look out onto the lovely courtyard, with its fountain and seating areas. Suites in the newer buildings have private patios with outdoor fire pits. Perfect for staying cosy in one’s bathrobe while sipping newly purchased local wine or bubbly. I can’t tell you how excited I was to enjoy a glass of wine by the fire as the sun set! For warmer days, there’s a pool and hot tub on the six acre property. 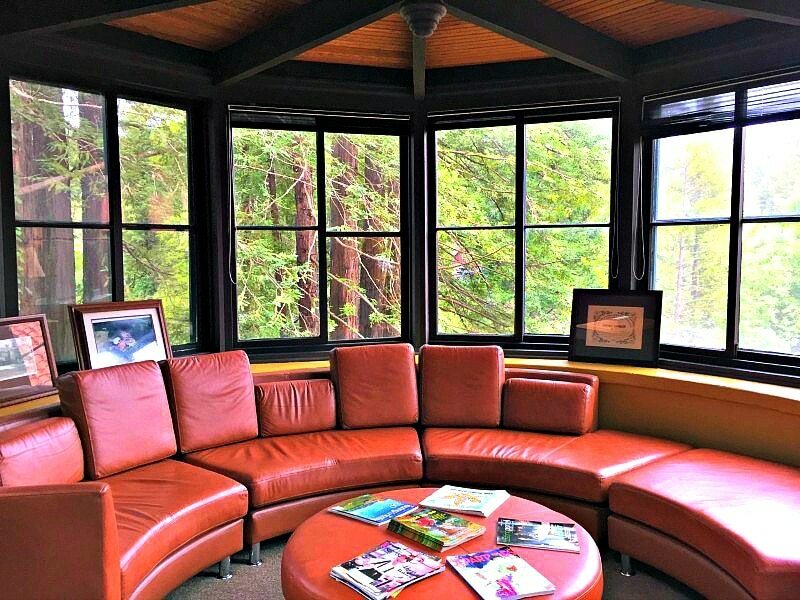 There are many comfortable seating areas for relaxation and reading. The small spa is large enough to accommodate a couples massage, with a jet-tub for two to relax in afterwards. The local masseuses are skillful, applying just the right amount of pressure we asked for. 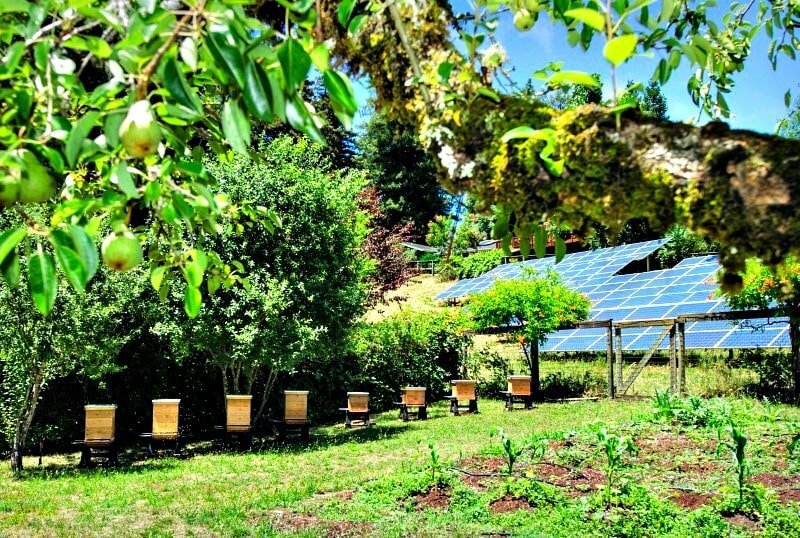 The inn is working towards sustainable energy and agricultural practices. The entire property is heated by a solar panel array for much of the year. A portion of the grounds was once an apple orchard. Quince and fig trees bear fruit, which is used in the Inn’s restaurant. 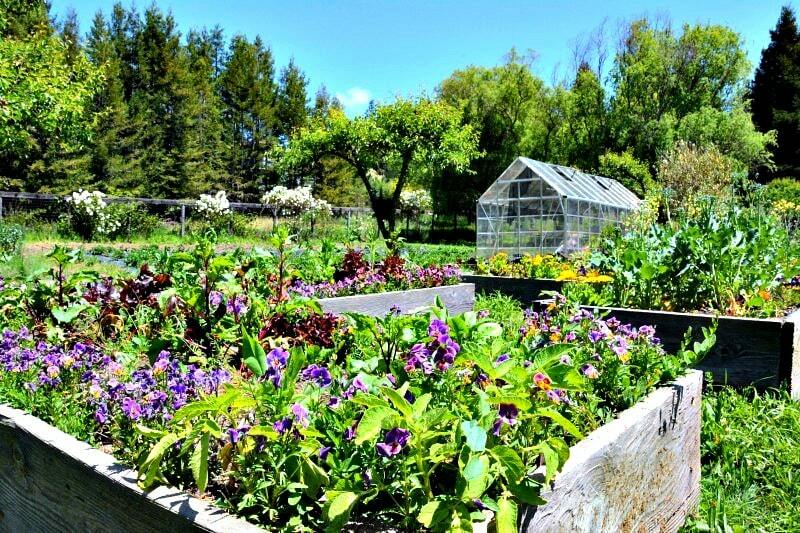 The renovated henhouse sits next to a rejuvenated herb and vegetable kitchen garden. Applewood Inn even has its own bee hives for pollination and honey production. Guests are welcome to wander the grounds and enjoy the space, the quiet only broken by the occasional owl hooting in early evening. You may also spot grazing deer or wild turkey as you walk. 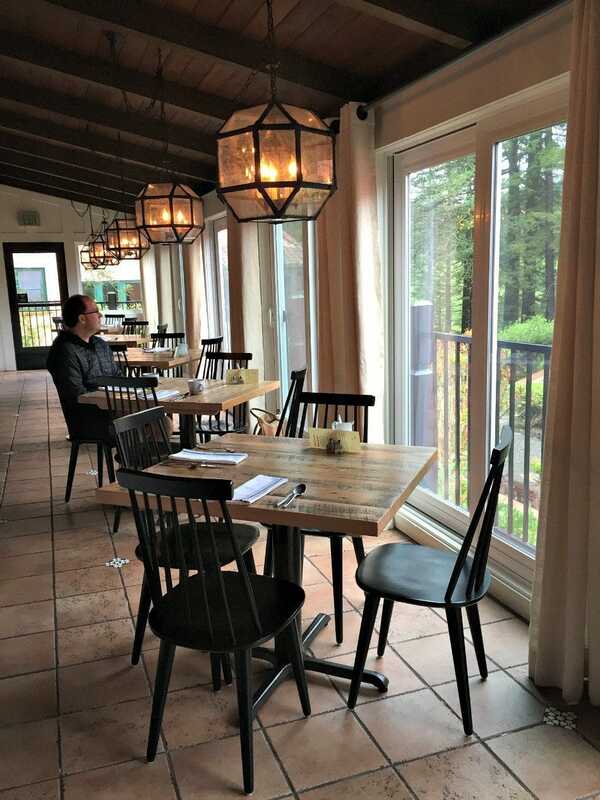 Applewood Inn’s beautiful, barn-like Pinoli Cucina Rustica Restaurant features Italian specialities focused on locally sourced products. Like many Sonoma Valley restauranteurs, Chef and Owner Christian Darcoli celebrates farm to table cuisine. In an area of such agricultural abundance, this makes perfect sense. Diners are treated to the freshest vegetables and fruit, handmade pastas, and locally sourced meat and fish dishes. 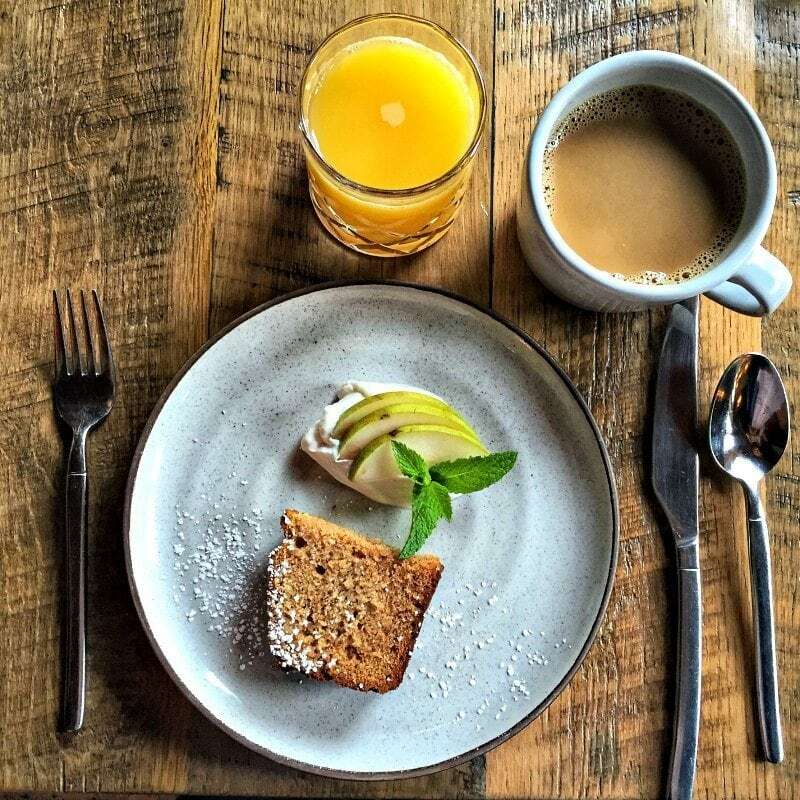 Breakfast is a two-course delight. Start with a fresh baked pear muffin or apple bread. The second course consists of an egg dish of benedict or hash, depending on what the chef has planned. The restaurant can accommodate dietary restrictions as needed. Everything we ate was scrumptious and presented by the chef himself. How he managed to time the cooking with service is beyond me. Pinoli Cucina’s dinner menu showcases local greens and seasonal vegetables. 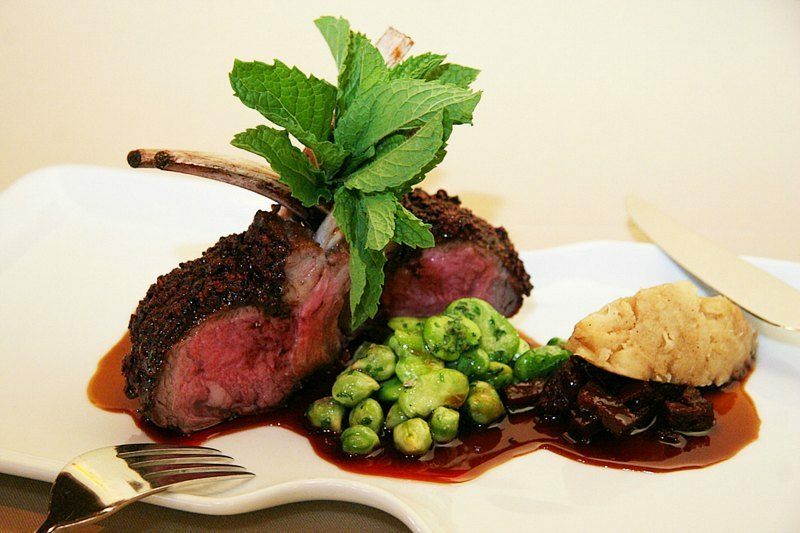 Mains include fish, local duck, game and steaks prepared in Italian style. Homemade sauces (with or without meat) accompany the handmade pastas. Chef’ Darcoli’s grandmother’s recipe of large ravioli filled with lamb, pork, sausage, and beef ragu is a must try. The Applewood Inn enjoys high season in the summer months. Its location close to the coast ensures that temperatures here are often 20 degrees cooler than in eastern Sonoma Valley. This is a welcome relief during this hot and dry season. In spring, guests should venture to the coast with their binoculars. You may see migrating whales on their way north to Alaska. And don’t miss a drive along the Russian River and along Highway 1, no matter what season you choose to visit. After a few days at Applewood Inn, I predict a softening of clenched shoulders, a sparkle in your eyes for your partner, and a replenished well of patience for your children. Read more reviews of this bed & breakfast and book your stay through TripAdvisor now! Have you ever stayed at a bed & breakfast like Applewood Inn? 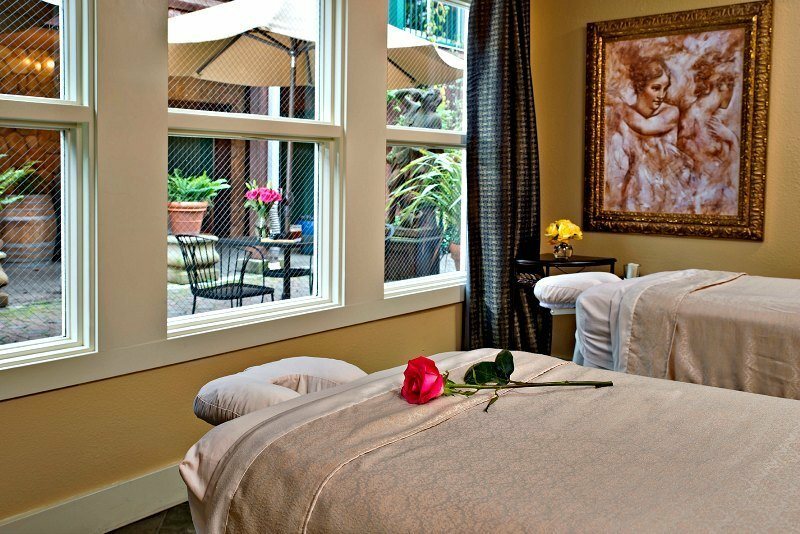 Do you have any questions or comments about a Sonoma Valley romantic getaway? A Note from The Curious Travel Mama: My husband and I enjoyed a hosted stay at the Applewood Inn for purposes of this review. As always, my opinions are honest and my own. Top photo by Claudia Laroye. That looks like an amazing place! I love the food, I love the atmosphere, and I LOVE where it’s situated. I could go for several days there. I felt like I was beginning to relax just reading this review. Beautiful! This place looks absolutely amazing. I’m pretty sure I would sit by the garden and read a good book. Applewood Inn looks like a peaceful getaway that would make it great for anyone seeking to get lost from the reality of life. Glad you shared your experience here and those photos are just amazing. I would love to get away to Applewood Inn. What a relaxing place to spend some time away from home! I think I’d really enjoy a carefree stay there! It seems so peaceful. This looks like the perfect place for a romantic getaway. I am due for one with my husband soon! Oh nice!! What a peaceful place. It looks like such a nice weekend getaway. 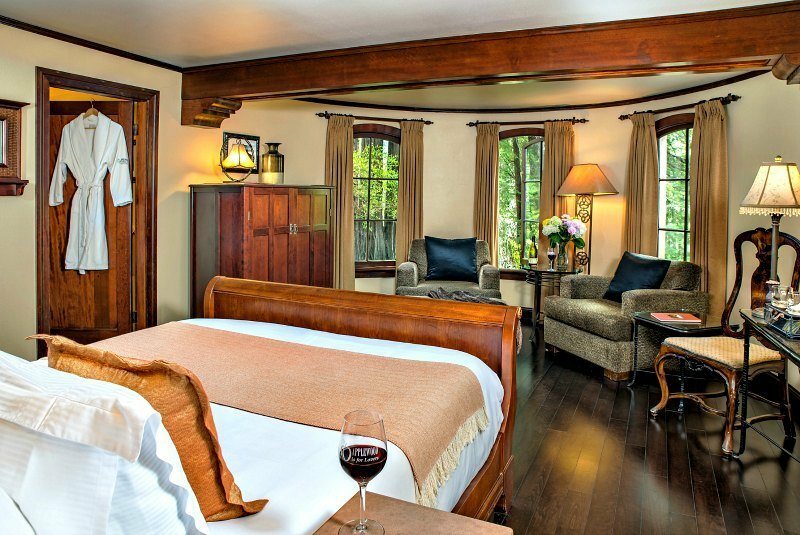 The Applewood Inn looks luxurious, yet cozy. I would love to take a weekend getaway and stay there! So cool that you could possibly see the whales migrating too! Everything, from the room to the pool is beautiful! It’s not just romantic but relaxing as well. I’d love to go here someday and just enjoy the quiet. It’s so hard to get away from the kids. However, you’re right, at least once, it would be nice to not have to let your brain be on high alert. What a nice and cozy place to stay for a romantic getaway. I love the wood interiors! It definitely gives the place its rustic charm. I would be thrilled to have a chance to be there for one weekend. Hope that will be soon! This looks like an incredible place. I love when it is beautiful on the outside just like the inside when I stay somewhere. I couldn’t agree more! I am in LOVE with this place! Gorgeous! This would be a perfect weekend. Calm, peaceful, and so beautiful; I love it! This looks like a place I would love to visit. It’s so beautiful and I’ve never been in that part of the country, I need to check them out! Wow what serenity! Look at the amazing views and looks so gorgeous and relaxing! Wow, this does look so romantic! I would love to get away with my husband and spend some time here!